Albert Whitman & Company, 9780807578742, 32pp. 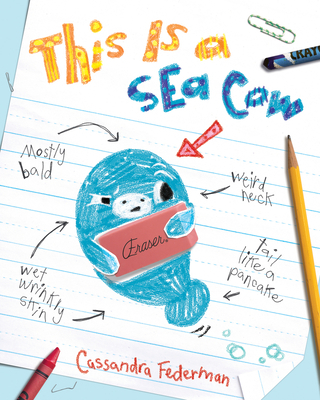 When an imaginative second-grader writes a school report about sea cows, the subject is not happy with her portrayal. Sea Cow—or Manatee, as she prefers to be called—comes to life on the pages of the report and decides to defend herself against unflattering comparisons to set the record straight with fascinating facts about manatees. Cassandra Federman is a writer and illustrator in California. She is originally from Massachusetts, but like manatees, she hates to be cold. She studied abroad in Belize where she rescued an orphaned manatee. She hopes this book will result in the rescue of many more.